The ability of the OSD to recognize the number of connected monitors. The ability to create Pools. Includes Dashboard, a software package used to configure the network interfaces, manage services and to enable and manage redundancy and file synchronization. The intuitive graphical user interface enables fast set-up and control of each Matrix Switch (also called a Switch or Router) in the system. Tabs along the bottom of the screen allow users to navigate effortlessly through the Drag N Drop, Connection and Macros pages. 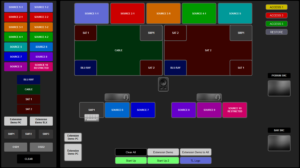 The Drag N Drop Graphical User Interface makes it easy for users to visualize their work stations onscreen and switch Sources and Destinations by simply moving an icon. As room configurations evolve over time, icons representing Sources and Destinations can be added or removed from the layout as required, making it simple to adapt to changing requirements without moving a single cable or wire.